A big jumper like this one can easily be used to conceal a multitude of sins... too many mince pies (we have eaten a tonne of them already) and thermal layers! I often laugh out loud at some winter outfit suggestions I see online, especially fashion websites. Unless it's unseasonally balmy (or I'm dashing into a taxi) bare ankles, legs and/or arms are a big NO during a Scottish winter. Unless I wanted to lose a digit or two!! A big jumper also makes the perfect partner for a pair of leggings. Leggings worn as trousers can be very hard to pull off without looking like a slob but a big jumper and a pair of tall boots can ease the pain. Just make sure your jumper is long enough to cover your bum... completely! Bare legging-clad rear ends NEVER look good. Today I'm wearing this chunky monkey jumper with a pair of vinyl leggings and my favourite boots. You can see these leggings worn for a wedding (yes really!) HERE and how to wear (any type) leggings HERE. Layers, layers and more layers are lurking under this ensemble! I feel cosy and (almost) chic. Of course a gigantic jumper and leggings outfit will never look particularly stylish, cutting edge or fashion forward but they work so well during the colder months. What is your go-to cold weather outfit? Please share your staples, I'd love to try out your suggestions! BOOTS: Cat... older than time itself! Samantha, this look is UBER chic. I absolutely adore oversized jumpers but the weather here in Malaysia just doesn't permit it; I do however go for a lot of those thin sweater-like tops to compensate for it! 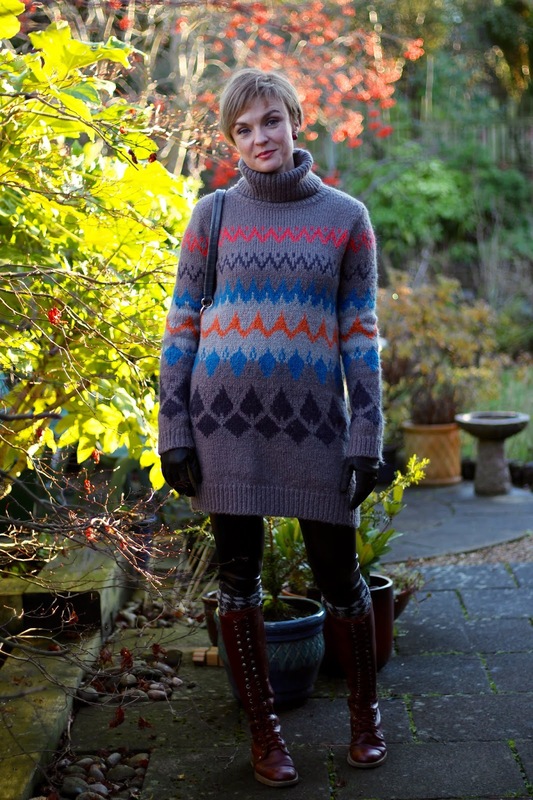 Pairing that jumper with the leggings and high boots make you look super au courant. Also - LOVE that shade of your hair! I wonder if there's a hair colour you CAN'T pull off? Hahahaha... you are generous Liyana! I felt more "slobbing bag lady" than "chic" but I love your comment. As for my hair... thank you so much! Thank you so much Lise! Hahahahha... you are funny Lisa! I'd love to have a rummage through some London charity shops with you... I wonder if the pickings are better or if the chic city types snap them up quickly?! 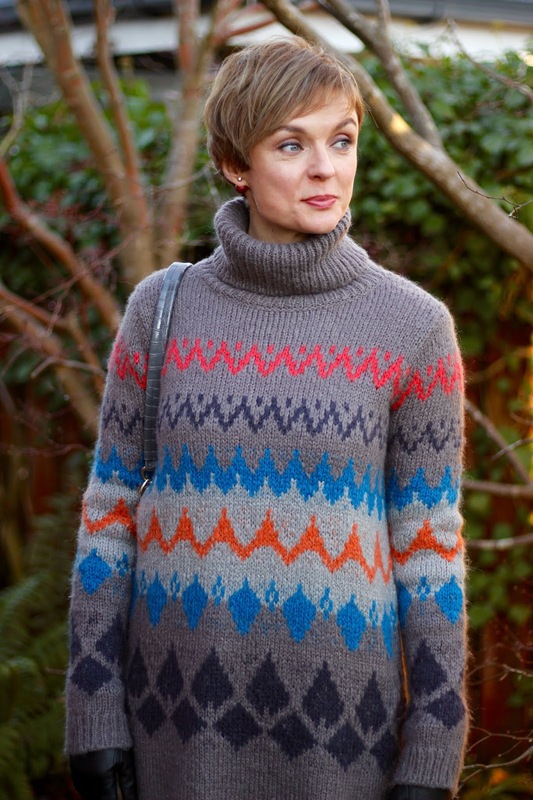 I love this look, Samantha, and so happy to see that you bought it second-hand! I had a lovely one like that (and I am in SUCH agreements over the length with leggings!) but it was just too warm to wear. Even though Canada has a reputation for being chilly, where I am it doesn't get that cold. Well, it's cold to us, but the rest of the country laughs at us. I'm SO surprised by that Sheila! I (ignorantly) thought Canada=COLD...and that was that. If you ever visit Scotland pop in and borrow this jumper, you'll need it! what a lovely outfit and lovely advice too!. 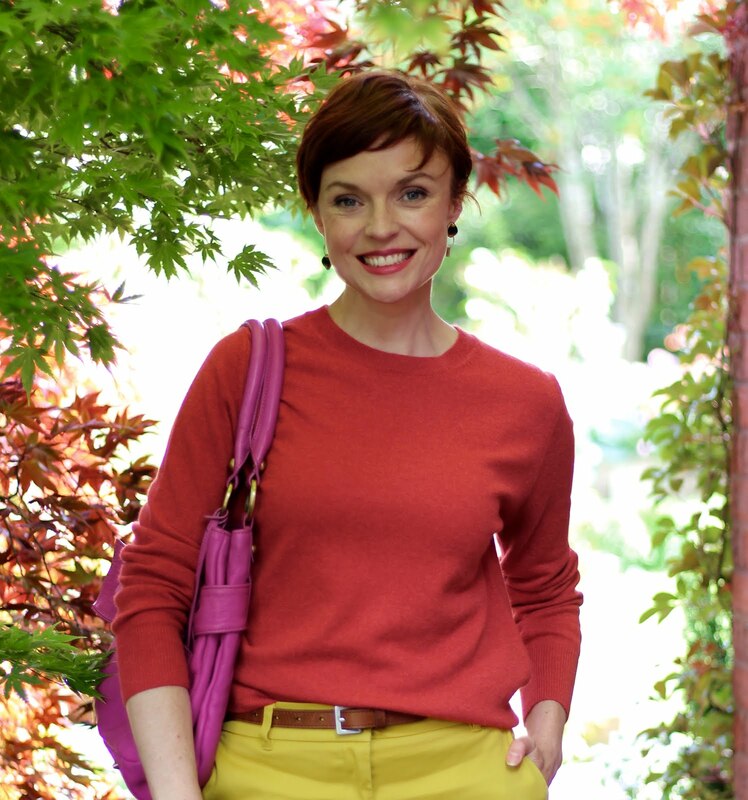 I like leggings, but sometimes they're tricky to style (totally agree on covering your bum!) and you rock them!. 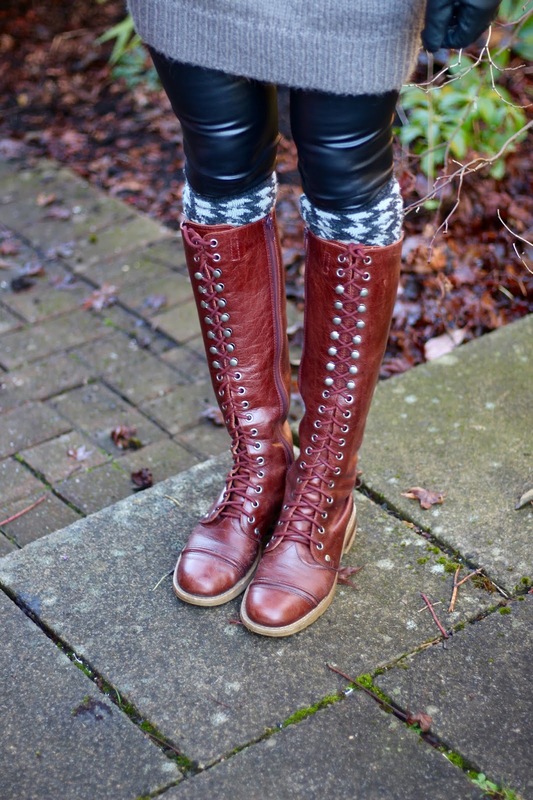 I think that mixing textures makes a difference, love your vinyl leggings with the cozy sweater and boots. Fabulous ensemble! And you look absolutely comfy&cool, gorgeous!. Your big jumper is stunning! And I've also laugh at some 'Winter outfits' I've seen at magazines, which are ridiculous even in our mild climate. Any bare bits make me laugh Monica! Of course bare ankles look much more chic than wooly socks but I'm not a fan of being cold... and my ankles are SO narrow. There's no insulation down there! I am always on the lookout for chic socks to wear with brogues. Thank you for your kind and supportive words, I always appreciate them! Love everything about this - as Lisa said, I was hoping to be able to shop it but nooooooooo #sob Your charity shop skills are beyond amazing! One day we'll get a charity shop rummage together Catherine! Maybe fuelled by a cocktail?? I'm SO glad you like my boots. They're my (very) OLD favourites and the leather is starting to thin slightly... much to my dismay! I've had them re-soled a few times and each extra year of wear is a bonus. I'm glad you agree about the bum/leggings issue. The amount of 'long' tops I see out and about that just ride up and flash the unflattering legging-clad flesh is sometimes too much to handle. This jumper could almost be worn as a dress so I feel that my rear is safe!! Gosh Sam,this is really almost a uniform for me when I'm at home as well as out and about (on occasion). Retirement routines generate an individual, functional style I think. Your geometric print sweater/ jumper is also a design I favor. My sweater collection has been gathered over many years and I have a nice bunch of Nordic style sweaters as well. I agree that it's important to wear a tunic length top to cover the bum. I also use short athletic style skirts for that purpose. I haven't found a pair of leather look leggings that I like but I love You in yours. You look toasty warm and awfully cute here Sam! I have a bit of a thing for jumpers too... I can't walk past a ail of them without a rummage. I don't think we can have too many, can we? As long as they're all getting worn and loved.